Last weekend was the one year anniversary of our amazing New Orleans dream wedding. It also marked the third week of punishing New England winter weather. Our kids actually had four and a half days off school in the past two weeks due to snowstorms. Let’s be honest, it’s been brutal. So when it came time to plan for our first anniversary trip, we knew that it had to be a weekend getaway in the South. Between my worsening Vitamin D deficiency and a mild case of Seasonal Affective Disorder, I knew that I had to see the sun. Fortunately, we planned a romantic weekend trip to sunny Atlantic Beach Florida. Atlantic Beach is on the Atlantic coast of Florida about half an hour from Jacksonville. We were extremely fortunate that the weather was in the upper 70s and sunny for most of our stay. 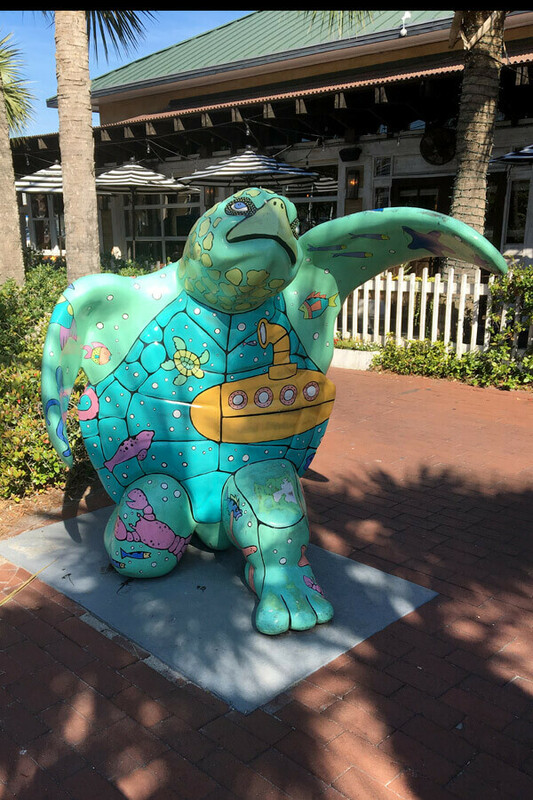 We were able to walk the white sand beaches, explore Neptune Beach, Amelia Island, and St. Augustine, sit by the hotel pool, and walk extensively around the area near our hotel. Atlantic Beach Florida turned out to be ideally situated for a wide variety of activities. In the summer, Atlantic Beach also hosts sea turtles who come here to lay their eggs before returning to the sea. While we missed sea turtle season by a month, we would love to come back and see this amazing phenomenon. 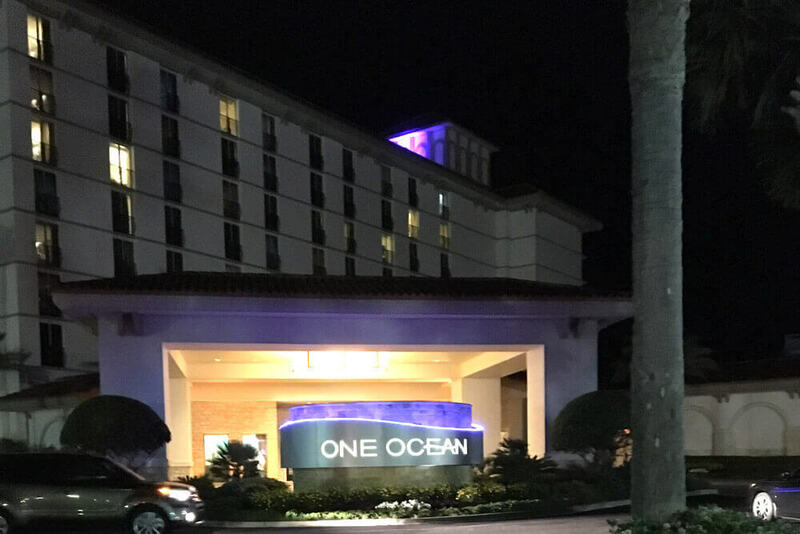 After extensive internet research, we made a reservation at One Ocean hotel in Atlantic Beach. When we arrived, we learned that the hotel is right on the border between Atlantic Beach and Neptune Beach. The location was ideal, with a wide sandy beach that, at least in mid-March, was fairly sparsely populated. Our hotel was one of only three in Atlantic Beach. It was quite luxurious, and offered amazing personal service. Our room was very clean, nicely appointed with a warm comforting feel. The king bed was very comfortable and had six pillows, a personal thrill for me, an admitted pillow addict. The staff were very friendly. The hotel has no separate service elevator, so we spent a number of rides with staff members during our stay. This helped give our visit a relaxed, sociable, laid back feel. One Ocean proved the perfect remedy for our New England winter blues. Unfortunately, the hotel, as so many do these days, had a resort fee which we were aware of prior to arrival. However, it also had a required $29 valet parking fee, which did not know about. The area has a severe parking problem, so some sort of fee is probably appropriate. However, the one-two punch of the $30 resort fee and $29 parking fee (plus taxes on those fees!) took the hotel to a price range that was more than we had planned to pay. As a result, we will probably not stay there again. However, we did thoroughly enjoy One Ocean and can highly recommend them for those who are willing to pay for luxury. The best surprise of our trip was Neptune Beach. Right across from our hotel was a shopping area of about a four square blocks that featured at least 20 different restaurants. I can honestly say that every one we tried was a home run. Even better, none were particularly expensive. We were repeatedly surprised by the reasonable price of our meals every time we got the bill. If you love food, you are going to want to visit Neptune Beach. We enjoyed Neptune Beach’s restaurants so much that we have decided to devote an entire post to them. While we very much enjoyed soaking up the sun at the pool and walking on the beach, we also took a couple of excursions to nearby towns. 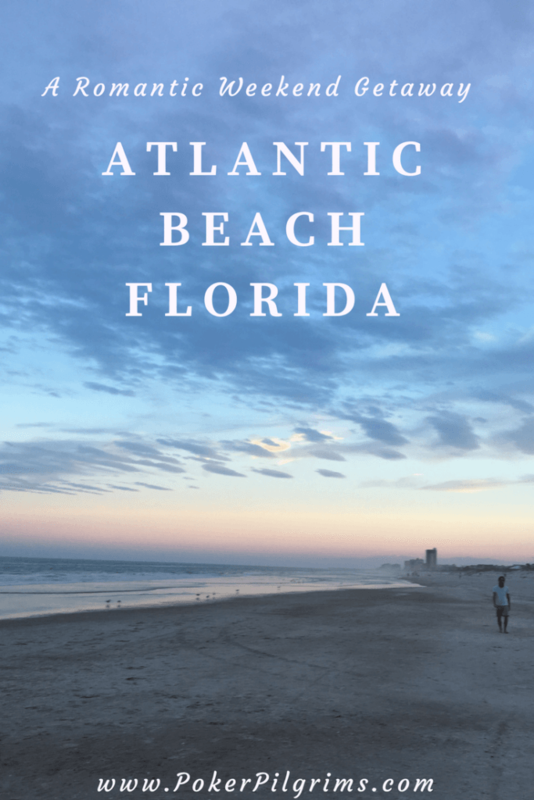 We drove north up the coast from Atlantic Beach Florida to Amelia Island, a popular beach destination in its own right. The beach route from Atlantic Beach was quite lovely. We drove North on A1A to the Mayport Ferry. For a mere $7, we were able to take the 10 minute crossing of the St. John’s River and then continue up A1A on Fort George Island. Much of this drive is designated as State Parkland. There are beach accesses, biking trails, and wildlife walks almost every mile. On Fort George you can hike, bike, kayak, fish, or just enjoy the ocean. Of course, as we discovered, every access point comes with a fee. So decide where you want to pull off in advance, as multiple stops could get pricey pretty quickly. Continuing toward Amelia Island, the drive gradually becomes more populated. We passed numerous gated communities, golf courses, and resort areas as we approached our destination. The drive was still pleasant, it was just a bit less idyllic. Fernandina Beach is the primary town on Amelia island. The center consists of a fairly large grid of streets hosting numerous souvenir shops, ice cream stores, clothing emporiums, and of course restaurants. We found Fernandina Beach to be pleasant, but relatively unremarkable. There is a nice marina at the edge of town with an attractive restaurant overlooking the water, and a museum of history housed in the old Nassau County jail. There are also a number of small artisan galleries in town. On the second Saturday of each month the galleries host open studios, complete with wine and hors d’oeuvres. Amelia Island notably boasts over 99 holes of golf. As we are not golfers, the afternoon that we spent there was sufficient to feel that we had explored the area fully. Saint Augustine is the oldest city in the United States and was originally settled by the Spanish. It is famous as the supposed site of Ponce de Leon’s Fountain of Youth. 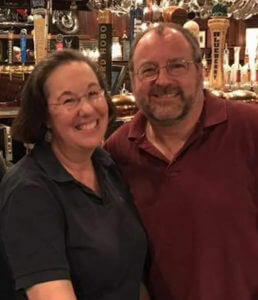 While we did not visit said Fountain, we did pass a lovely afternoon in Saint Augustine on our romantic weekend getaway. Saint Augustine lies about an hour south of Atlantic Beach Florida on A1A. As with the drove North to Amelia Island, A1A South offered lovely vistas. After a brief excursion through the heavily populated Jacksonville and Ponte Vedra Beaches, A1A enters the Guana River Wildlife Management Area. The WMA features beautiful deserted beaches and numerous wildlife viewing opportunities. This area boasts endangered right whales in the winter, as well as numerous birds, small mammals, and even the occasional alligator. You will have to pay for parking if you would like to pull off and explore. However, the parking area we pulled into only was $3, and the brief beach walk we took was well worth it. The beach is filled with beautiful shells, some unbroken and some crushed making up wide stretches of the beach. As you approach Saint Augustine, you traverse Vilano Beach. The houses along the road here are quite interesting. The architectural styles are eclectic, from bungalows to classic beach architecture, ultra-modern cubes, and even a turreted castle. We really enjoyed seeing this stretch of houses. Before we drove into Saint Augustine proper, we stopped for lunch at Uptown Scratch Kitchen. We learned about Uptown Scratch Kitchen online where Trip Advisor informed us that it was #1 of 426 restaurants in Saint Augustine. 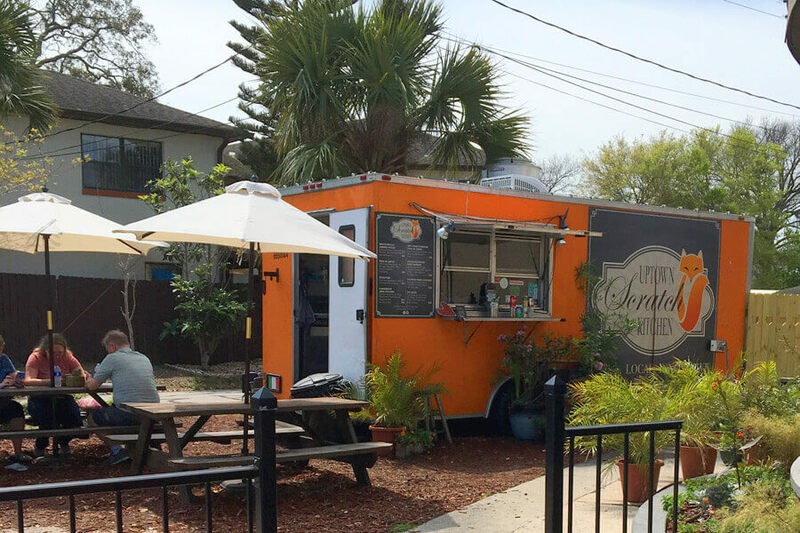 Believe it or not, the Uptown Scratch Kitchen is a food truck! Having eaten there, we can attest that the food was frankly amazing. They only offer about seven meals, but they are all classics: fried chicken, fish and chips, Philly cheese steak, and etouffee, to name a few. We can report that the fried chicken, cheeseburger, and onion rings were excellent. This may have been our favorite meal all weekend, and that’s saying a lot. Saint Augustine itself is a big tourist destination. There are numerous museums, trolley tours, “experiences,” and, frankly, tourist traps. 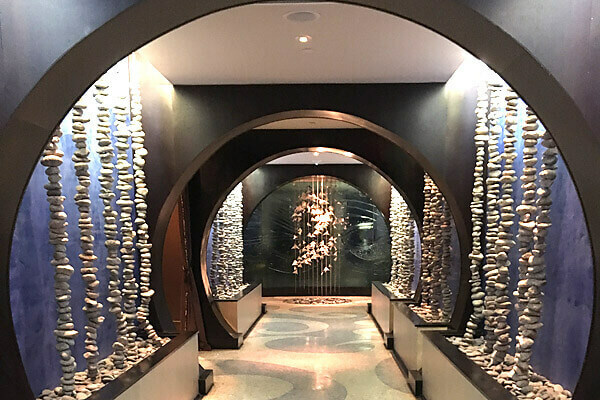 You can visit The Fountain of Youth, The Pirate and Treasure Museum, Alligator Park, Ripley’s Believe it or Not, the Potter Wax Museum, and on and on. Each of these attractions, of course comes with a hefty entrance fee. Even the St. Augustine Lighthouse will set a couple back $25 if you want to get close enough to actually see it. 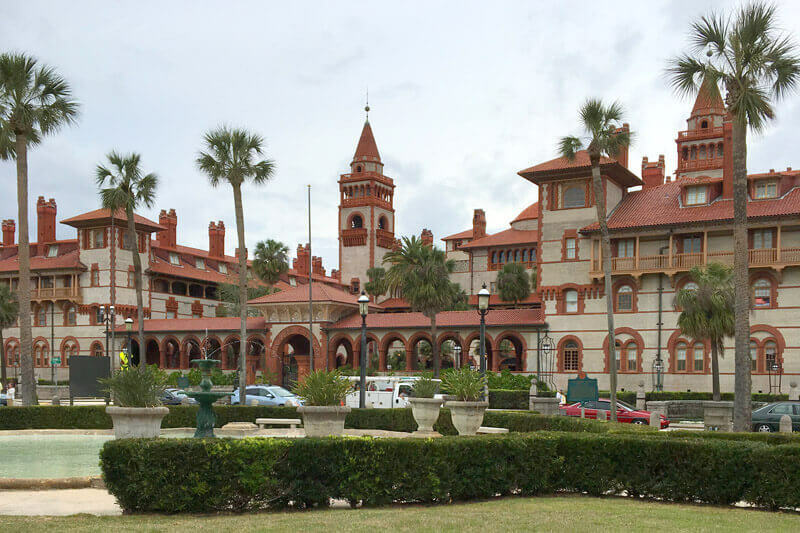 As a result, we restricted ourselves to wandering the streets of Saint Augustine, checking out the historic Spanish fort Castillo de San Marcos, and visiting the incredible campus of Flagler College. The tourist center of Saint Augustine consists of an area designed to echo old Spanish architecture. As with Fernandina Beach, there are numerous souvenir shops, clothing stores, and restaurants. However, something about the unified architecture of this part of Saint Augustine gives it a Disney Main Street vibe. Everything is just a bit too matchy and cutesy. Just outside of the “old town” lies Flagler College. The campus of Flagler consists of a former luxury hotel, the Hotel Ponce de Leon. The Ponce de Leon was built by Henry Morrison Flagler in 1888 and is stunning. The buildings left me wishing I were alive 100 years ago to stay in the hotel, or at least that I could go back to my youth and attend Flagler and spend four years on such a gorgeous campus. We enjoyed our day in Saint Agustine, but were happy to head back to Atlantic Beach where no one was looking to charge us to breathe. Our final excursion from Atlantic Beach was to play a tournament at BestBet Jacksonville. BestBet is a great poker room only about 20 minutes from the beach. 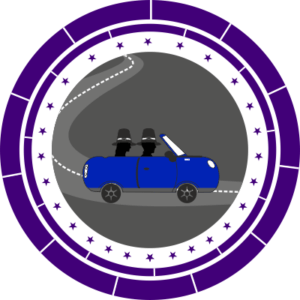 We review it fully in our poker room review post. We thoroughly enjoyed our romantic getaway weekend in Atlantic Beach Florida. We got to enjoy sun, sand, and great food. In the span of four days we visited three distinct areas of the Florida coastline without driving more than a couple of hours on any day, andd got in a fun evening of poker as well. We will definitely return to Atlantic Beach at some point in the future when we are again seeking an escape from wintry New England. Throwdown Thursday: Can She Handle the Long Flight to Australia?